a IBM 402 and an IBM 5?? calculator. only version of the alpha/num IBM 420). The fun was quickly gone. My next school was better equipt: it had a IBM 1401 (with 4kbyte ! ), an 1402 cardreader, 1403 printer and two 729 tape units. 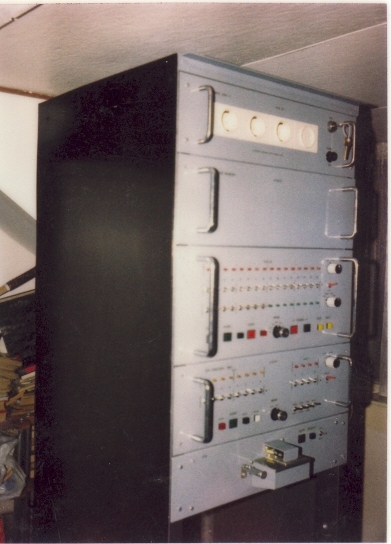 This 1401 machine was given by IBM and delivered with some IBM System/360 model 50 Field Engineering documentation. I have no idea why, but these manuals gave me for the first time good inside knowledge of micro-programming. was priced at Nfl 1200,- (USD 500,-). This was too much for a college kid like me, so I decided to built my own computer with TTL logic. The machine architecture was more or less copied from the M6800. It was micro programmed with 256 words of 40 bits each. In 1981 I met my wife and all my HJS22 computer activities where then stalled. renamed it later to HJS22.